What comes to your mind when you think of the phrase, "Made with Love?" What would you photograph? I'm participating in Project 52 at Life with My 3 Boybarians. Last week's photo: "Resolution"
Such a beautiful photo! I love that everything in the photo has such meaning. Oh my...so much packed in this picture!! It's just beautful in every way! Hope you have a blessed day! What a sweet photo! I love the stark white. gasp! those little feet! beautiful photos. So sweet! Your little Lucy is adorable, and I love that your hubs made the doll bed! Thanks for sharing. So beautiful... Especially sweet Lucy! Amazing stories, memories, and photos! Of course! 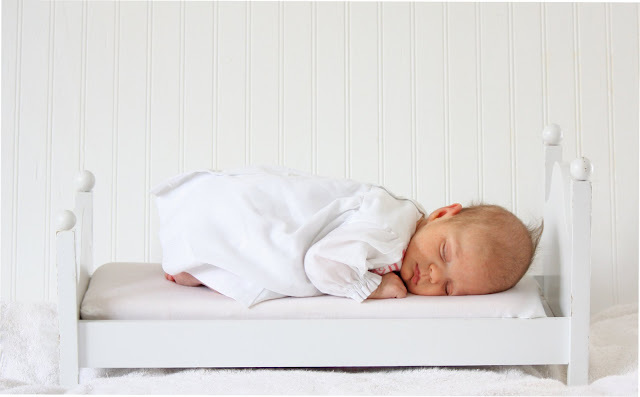 Your sweet newborn - what a lovely interpretation of this week's theme! Happy weekend. Beautiful pictures, Laine! And I love the all-white concept that accentuates little Lucy in such a lovely way! Such a sweetie! Oh, and just gotta *love* those tiny feet! Precious! SO very sweet! it's even more special with that adorable baby bed and the dress! Gorgeous! So many special memories in one picture. how sweet, love the story and pictures! Beautiful post and beautiful baby! I just love those little feet! Babies are just screaming LOVE! Love the little feet. LOVE your pictures, the story behind it all, just adorable! You are need to scrapbook this picture and the story for her to treasure later. So precious! Sweet story. Sweet doll bed. Sweet baby. Sweet photos! Absolutely perfect in every sense of the word! I love the whole post. The beautiful pictures and the story behind each. Baby feet just get me every time. Congratulations of your beautiful baby. I miss the days of making wonderful little surprises for the kids. They get older and don't appreciate the simple things so much. When my oldest son was about 5, he needed new rubber boots, and we were talking about where to look for them. He was so used to us DIYing, sewing, etc, he was confused, and asked, "Can't Mom just make them?" So, so sweet. Love everything about your photos and your story.